PT Atlanta Head Judge Report - What's Up, Docs? There are quite a few sentences that are basic principles of Judging (another core principle can be found in the Judges of Note section of this article). Applying this one would have helped during game 4 of the Semi Finals opposing Luis Scott-Vargas to PT winner Jiachen Tao. When Tao cast Eldrazi Obligator off a Cavern of Souls (helped by an Eye of Ugin), he only had an Island and a Steam Vents left to pay for the triggered ability that would make him gain control of Scott-Vargas’s creature. He couldn’t pay, but nevertheless did, and Scott-Vargas conceded. I was at the table and I could feel something was wrong. Since both players were generally playing fairly fast and that spell was game decisive, I have not been able to know what was wrong before the concession happened. My instinct, i.e. the immediate and automatic reaction that uses the nervous system, warned me that something was wrong. However, it took my brain some time to process the information my nerves sent. As a result, by the time I could assess what was happening, it was too late. In this situation, I should have said “stop” immediately, then looked for what made me feel there was something wrong. When it comes to watching a game, acting is sometimes more efficient than thinking (which is rarely the case when it comes to solving organizational problems by the way). A mistake had happened, but since a concession had occurred, there was no way this would be reversed. I therefore had to consider whether Cheating was involved, which I excluded based on the fact everything happened fairly fast and, had Tao paid more attention, he could have cast the Obligator using Steam Vents, leaving Cavern of souls untapped to pay for the trigger. It wasn’t even more “safe” to use the Cavern since Scott-Vargas doesn’t run any Countermagic. Since there was no Cheating involved and the concession prevented to backup to the point of the mistake, I simply let the situation stand, issuing a GRV Warning to Tao. His opponent hesitates and calls a judge. Indeed, the player who said “OK, Go” had previously chosen to play first. After thorough thinking, I ruled that the player can play a land. Toby and I discussed when we should rule when a player is confused as to who should be playing first or has a small absence of mind. We both believe that we should consistently rule that the player can play a land unless he actively wants to play nothing on his first turn. The game has not really begun, no information was gained… There is no reason to not allow the player to play a land. It is possible to have cards on the laps without it being Cheating. You just need to drop part of your library when resolving a Fetchland. This would have been easy to solve, had part of the library not fallen on top of the player’s hand, as you can see on the picture. That’s a perfect example of Hidden Card Error: Several cards whose identities are unknown to one of the players have been moved to another zone whose content is unknown to one of the players. Therefore, we simply needed to have the opponent look at the cards present in the rough area where the hand was and have him remove a number of cards equal to the excess. We did not consider the cards that fell on the laps because likely they directly fell on the laps and never touched what was previously the player’s hand. Based on the picture and the position of the cards, how many cards do you think were in the player’s hand prior to the mistake? Two or Four? Well, it was actually three, as revealed by a card count (whose technique is described here) that I performed just for the sake of confirming, and which turned out to be a good idea! 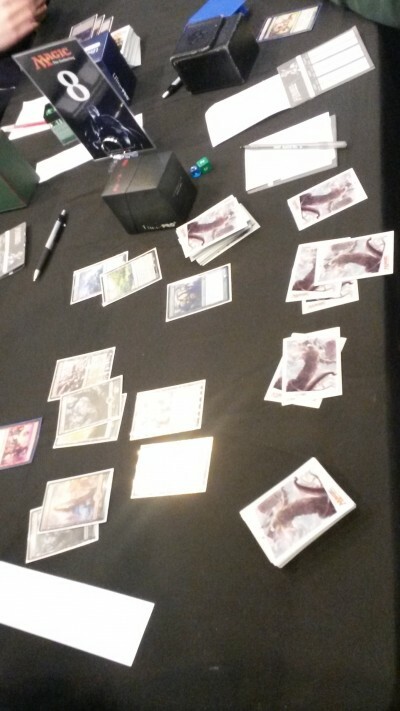 AP puts LftL in the middle of the battlefield, then reveals the top three cards of his library (which he claims are one red card and two lands) by putting them in the middle of the table as well. Then, instead of picking LftL, AP mistakenly picks the three revealed cards and puts them in his hand. The call became some more complicated because NAP was not positive which three cards they were: If he was fairly certain there was a Conflagrate and a Ghost Quarter, he did not know what the third card was. Because the cards have been revealed at some point (which both players agreed on), the cards are considered publicly known and this cannot be HCE, even if the opponent indicates he does not remember one of the cards (see later). It is therefore either GRV or Cheating. I did not consider the position of the cards in the hand, despite AP consistently showed me that the black card was on the other side of the Squee compared to where he put the three dredged cards (a position that the opponent agreed on): Indeed, I have no evidence that these cards weren’t moved around at some point, especially as this was an appeal so multiple manipulation had ample time to have happened before I arrived. NAP wasn’t sure which was the third card, but he knew that one of the cards was red. Therefore, since the non-Squee card AP claims was already in his hand was black, I assumed that NAP would have noticed its color, had it been dredged this turn. I also believed that NAP was honest when he said he wasn’t sure which was the third card: Since I believe there were indeed two lands and that lands are usually less interesting, strategically speaking and especially in a deck that aims at discarding them to a Zombie Infestation, I can totally believe that NAP did not pay attention to the lands. Since I concluded no Cheating was involved, then it had to be GRV. Since I did not believe that AP was lying to me as to which cards he dredged (with the color reasoning as a solid support), I chose to trust AP and sent the two lands and the Conflagrate to the graveyard. He also received a Warning for GRV. It is tempting to rule HCE here, based on the fact NAP does not know what the third card was. That is actually what the Floor Judge ruled initially. Therefore, a ruling in this situation needs to follow the policies with a logical reasoning. The fact the opponent has a doubt about the dredged cards, no matter how legitimate it is, does not justify to deviate from the policies. At some point during the Pro Tour, L2 judge Mikael Rabie , who is quite keen on watching PT live coverages and good at spotting weird moves, sent me a text message to bring to my attention that a player didn’t search for a basic land after his opponent cast a Path to exile on one of the player’s creatures, topdecking a game-decisive spell the turn after. This was very coincidental and deserved an investigation: Why would a player decline to get an extra land? The most obvious option is that his sleeves may be marked and he knew what he was to draw the turn after. But before going to the table, I followed Mikael’s piece of advice: Since the player was playing Naya Zoo, which run between two and three basic lands, and the player already had two of them on the battlefield, he may be running only two and, before interrupting a game that was played under camera, I should check for the number of basic lands on the player’s decklist: Since he was playing only two, I excluded Cheating and didn’t interrupt the game. It’s only through hearing feedback that we can improve. On Sunday, Matt Williams and Jess Dunks came to me to discuss constructively how I could have handled the scheduling of breaks better. If the unique structure of the PT, where the pace is led by Coverage, made it harder to strongly codify breaks and I knew I could not anticipate when to send judges on break, I should have communicated that lack of structure to them. By not doing it, I failed to manage expectations and I also did not allow Team Leaders to come up with a plan of their own, which would have relieved me and likely enhanced the judges’ day. Even when you know you won’t have a plan, say it! During an investigation where I was a little confused as to what had really happened, Hans Wang brought to my attention that the contentious play was actually game-decisive. If I have emphasized in multiple reports that checking life totals is an essential tool when investigating, I had completely failed to do it this time, while that proved to be an essential piece of the puzzle!